We are happy to announce the AMAZING Slow Motion Billiard Trick Shots featuring Florian "Venom" Kohler is back with part II! Your excited responses to part I have been amazing and now we've got even more incredible trick shots to share. Having access to the Super Slow Motion "Phantom" camera, which shoots at up to 6000 frames per second, was A TON OF FUN and allowed us to show some aspects that would normally be impossible. Watch as Florian shows incredible skill and control with his trick shots and stick around for the exclusive behind-the-scene footage of this crazy shoot. After you watch the video, if decide to try pulling off some of those insane massé shots on your own you're going to need a special cue. 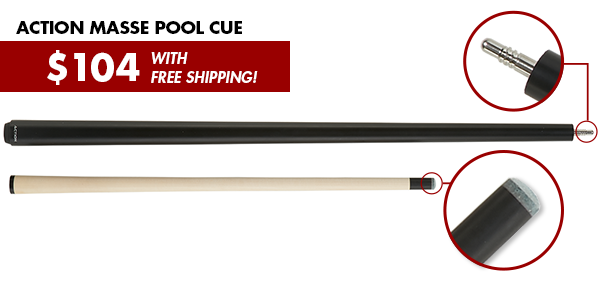 Normally, massé cues start out at 3-4 hundred dollars but the Action Massé Pool Cue has all the same specs at a fraction of the price. This 46 inch long cue weighs 25oz, has a 14mm Elk Master Tip (very soft) and a stiff shaft, which is ideal for making those complicated massé shots a lot easier. Special thanks to Florian, Venom Trickshots, Killer Dutch Agency and Kuma Film! For more slow motion videos and hundreds of training articles, follow our Facebook page and sign up for our mailing list to receive weekly updates!